The NJEA is responsible for being the support system and leader for the community of teachers in the densely populated state of New Jersey. Every year the NJEA presents a conference to offer new ideas, conversations, and solutions to their on the court educators. This year I was honored to be present at the convention center in Atlantic City, watching people walk the isles and participate in workshops on various topics. 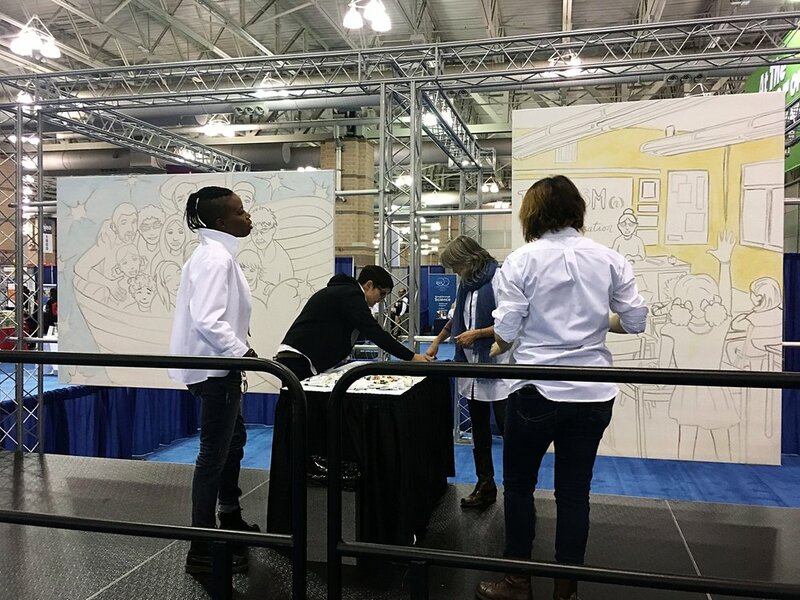 Our booth, led by artist Kelly Sullivan, was leading people through a group painting project called Finger Smear. The 3 canvases we were working on each tackled a hefty topic teachers are dealing with in the classroom: Racism, Immigration, and LGBTQ. Many people close to me have been teachers, including my ex-husband. So teachers hold a very special place in my heart. They give even when its unappreciated, they stand even when its inconvenient, and they persist even when they feel like they have no support. Few professions come as close to shaping our youth as teachers do. Teachers are one step away from parents, and sometimes spend more time with the children than parents themselves. To be part of the collaboration between Kelly and the NJEA in benefit of the teaching community was quite a privilege. The all female group of artists that came together to facilitate this project were a joy to be with, and I think our magical chemistry made the conference fun for everyone who stepped onto our stage. Plus, I think people liked the part where they got to wipe their paint on our shirts. I even ended up with a smiley face on my back, courtesy of one of the more outgoing and upbeat teachers.